The sidewalker is directly responsible for the rider. They walk beside the horse, even with the rider's knee, and give the rider support. The support the sidewalkers give is either at the joints, a light pressure on the thigh with the hand, or their forearm over the rider's thigh with the sidewalker's hand holding the saddle or surcingle. The side walker must be aware of the rider, instructor and any activities in and around the arena or on the trail. He/she will be responsible for aiding the participant in traditional mounting at the ramp or mounting block. 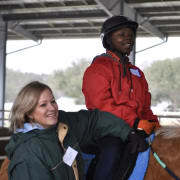 2 More opportunities with Charleston Area Therapeutic Riding, Inc.